FACULTY: 75% hold the highest degree in their field. Half hold degrees from universities in two or more countries. Welcome to Richmond, The American International University in London. Located in one of the great world capitals, Richmond distinguishes itself as a truly international university by enrolling students from more than 100 countries. The University’s academic program, which encompasses business, communications, international relations, journalism, and the arts, reflects the American tradition of broad-based core studies. Significantly, Richmond’s underlying theme is globalism. The 21st century needs leaders who are keenly aware of—and competent with—the diversity that exists in the world. The University’s academic program is particularly relevant to those who aspire to leadership positions on the world stage, whatever their chosen profession. 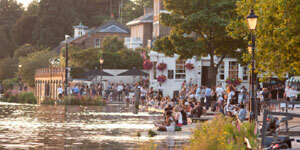 Richmond has campuses in two of London’s most appealing communities: Richmond-upon-Thames and Kensington. The Richmond Hill campus, which dates back to the founding of Richmond College in 1843, is the location for first-year and second-year students. Upper-division students typically relocate to the campus in Kensington, central London, where graduate studies are also pursued. Accredited in both the United States and the United Kingdom, Richmond’s American education in a London location offers a comprehensive—and profoundly awakening—university degree experience for a global future. In an increasingly competitive world, a well-organized internship represents a major advantage in the graduate job market, especially when that experience is gained in London—one of the world’s leading business and financial centers. At Richmond, internships combine an academic program with the opportunity to work in a major British or international organization while also allowing students to earn academic credit toward graduation. Students can complement their studies in London with a semester, year, or summer session in Italy at the University’s international study centers in Florence and Rome. 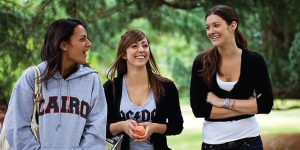 Courses are offered in Italian language, fine art, studio art, business, and social sciences.